Jammie Cats™ Count! The Magical Forest, a preschool counting book that covers counting from 1 to 10, launched nearly a year ago. In addition to writing the rhyming story, I illustrated, formatted, and self-published the book. Marketing is an ongoing and arduous task for any self-published writer because you need marketing materials plus an intelligent sales strategy. At least, as a graphic designer, I have the easy half of the battle licked. 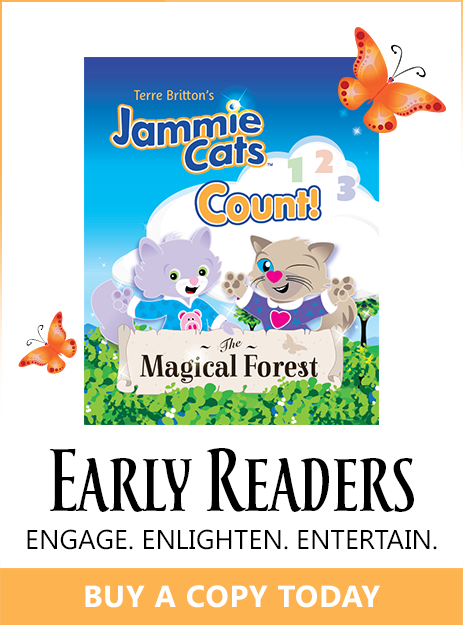 Below are a few of the marketing materials and images I created for Jammie Cats™ Count! The Magical Forest. For more information, visit the Jammie Cats™ website. What’s Your Preferred Software When Creating Interactive PDF Forms? Author TerreBrittonPosted on December 5, 2017 Categories 72 dpi, PollTags Adobe Acrobat, Adobe InDesign, interactive, Software, webdevLeave a comment on What’s Your Preferred Software When Creating Interactive PDF Forms? What is cryptocurrency and why is it important? Display the Text Wrap panel by choosing: Window > Text Wrap. Including a favicon on your web site helps visitors recognize your site-brand in both their browser tabs and as a desktop icon, if they happen to drag your url onto their desktop. I found a terrific Favicon & App Icon Generator on Dan’s Tools site. It’s just one of many amazing (and free!) webdev tools he provides. Click here to use the Generator. Jammie Cats™Count! The Magical Forest, Terre Britton’s debut picture book, is now available in hardcover and paperback on Amazon, Barnes & Noble, and at most online retailers, bookstores, and libraries. Click here to visit the Jammie Cats™ web site. Jammie Cats™ Introduce Alphabet Fruit: A Coloring Book is now available on Amazon. Click here to visit the Jammie Cats™ web site.